People wear activity trackers to make sure that they’re getting in their daily steps, monitoring their heart rates, and keeping in touch with their family and friends. But did you know that you can get paid for using your activity tracker? You may wear your tracker for the health benefits, but wearing one may be a way to benefit financially. Whether you use a Fitbit, VivoFit, Jawbone or another tracker, you may be able to make money. Whenever you exercise, these companies will reward you for your effort. Here are some programs that you can sign up with to start earning. If you already shop at Walgreen’s, why not earn extra balance rewards just for walking. All you have to do is connect your Fitbit or JawBone to your Walgreen’s Balance Rewards card; it’s easy to connect your device and start to earn points for walking. Visit Walgreens.com and sign up for a Balance Rewards Account (if you don’t have one already). Once you have a card, create (or sign into) your account. From the main screen, click on Account Home. Scroll down to Healthy Activities and click. 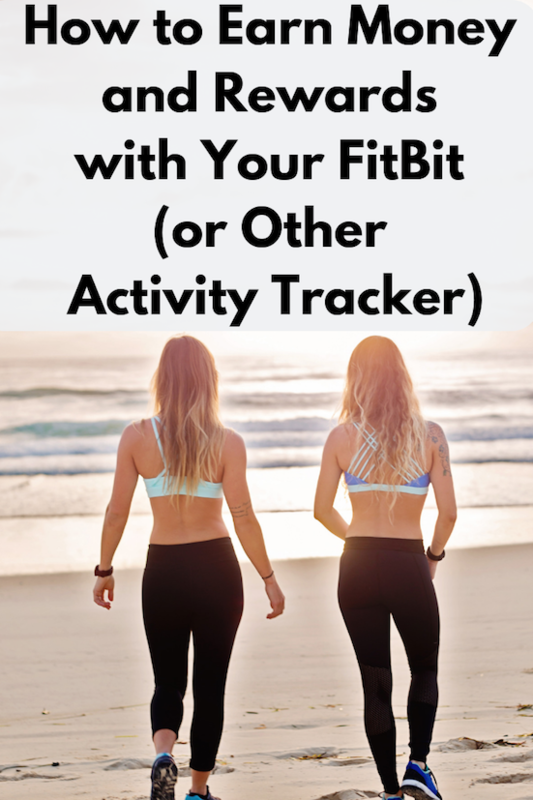 Follow the steps to connect your activity tracker. When you walk, you will earn points. You can redeem your points towards your purchases in the store. It’s like free money in your pocket. If you live in an urban area that’s close to shops and restaurants, check out Gigiwalk, an app that pays you to walk. The app is free, but you’ll be charged a PayPal fee. The way it works is you sign up for gigs. You can walk from location to location and take photos or do whatever they request. For example, you may be asked to photograph a display inside of a store and you’ll be told how much you’ll earn. Most gigs are retailers and brands looking for people to ensure that their products are being displayed properly. It can take anywhere from a few minutes to a few hours to complete a gig and pay can range from $3 to as much as $100. This is a health rewards program that allows you to earn points via your Fitbit (and other methods).You may even want to check with your insurance company or employer as some of them will even MATCH the points that you earn. Visit EveryMove.org and click the sign-up button. Once you set up your account, you’ll be redirected to a page which shows various devices, including the Fitbit. Click to connect your account. When you’re connected, you’ll then go to add your health plan, employer or even college (where you may earn bonus points or additional rewards if they participate). If you don’t have these, you can skip that step. The only downside to this program is that you don’t earn free items, but instead receive discounts on products that you purchase. Higi is an app that will allow you to either earn points to redeem towards products or make a donation to a charity. Visit higi.com and click the green SIGN UP button. Fill out the profile information. When you get to the screen to connect your device, click on the FitBit link. Follow the steps to link your account. Once you reach points, you can either cash them in towards discount codes or donate to a charity. The great thing about most of these apps is that they’ll work with any device that you have, allowing you to earn money while staying active. We all know that walking is good for you but did you know that it can help others too. That’s what Charity Miles is all about. As you walk, you earn money for a charity. You can select from one of 30 charities, including Special Olympics, Habitat for Humanity, and many more. The app uses motion sensors to measure your distance and pays up to $0.25 per mile that you walk or jog. Donations are made on your behalf from large corporations. They place a yearly cap on how much they will donate annually. Have you used any of these programs? Were you satisfied with them? I’d like to hear your thoughts.